Homemade pizza is another thing that has been on my to-do list for a long long time. Guess everything will happen when the right time comes! 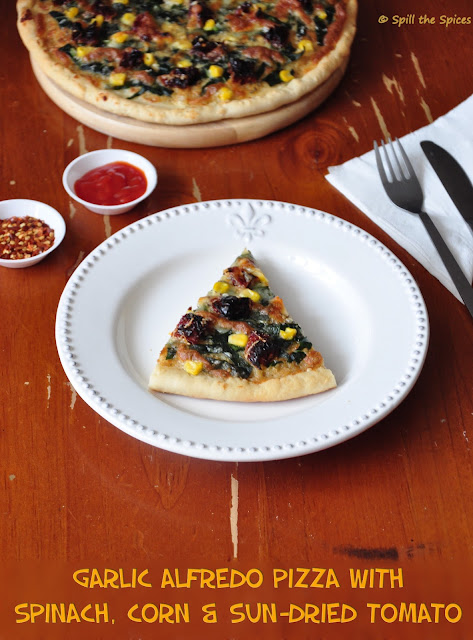 Finally pizza's turn has come up as the Groovy Gourmets picked pizza as this month's theme. And its not just any normal pizza, but an unusual one. The idea was to come up with a pizza with uncommon toppings than the usual toppings added in pizza, one more cheese other than mozzarella and a different sauce rather than the usual tomato based pizza sauce. For the pizza dough, I followed the one in Rak's Kitchen which is a foolproof recipe. Pesto sauce and white sauce are two good alternatives to tomato pizza sauce. I decided to make an Alfredo sauce as the base for my pizza. Alfredo sauce is a white sauce which is often used to accompany pasta dishes and made with butter, cream and Parmesan cheese. I added some garlic to infuse more flavor into my sauce. For toppings, I used baby spinach, sweet corn and sun-dried tomatoes as they paired well with my garlic alfredo sauce. I used a combination of mozzarella and cheddar for the final touch. The pizza tasted really good and unique from the normal pizza. It was a delight to bite into the creamy and cheesy pizza. I'm happy that my first attempt to make a pizza turned out fruitful. 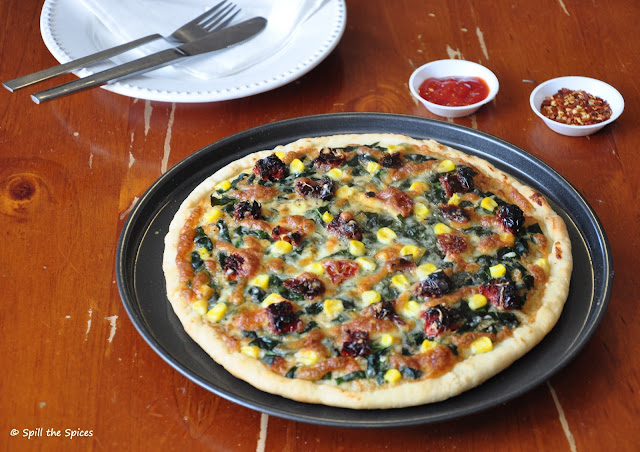 I have planned few more pizza's to make in future, so keep watching this space for more pizza recipes! 1. Boil the water and keep aside. In a wide bowl combine oil, sugar and salt. Then add the boiled water and mix well till sugar dissolves. 2. Add milk, mix and then add yeast and mix well with a whisk. Set aside for 5 minutes stirring occasionally. The yeast should be completely dissolved. 3. Then add the flour and bring everything together to form a smooth pliable dough. No need to knead the dough. 4. Cover the dough with a damp cloth and keep in a warm place for 1½ - 2 hours. After 1½ -2 hours the dough would have raised. 5. Remove the dough to a flour-dusted surface and knead very lightly to push the air out the dough. Roll the dough under the palm of your hand until the top of the dough is smooth. Cover the dough and set aside. 1. In a sauce pan add oil and butter. Once the butter melts, add the minced garlic. Saute for a minute. Then add the cream, salt and pepper. 2. Bring the mixture to boil and then simmer till the sauce becomes thick for about 3-5 minutes stirring occasionally. 3. Then add the cheese and cook for one more minute. Set aside. 1. Preheat the oven to 220 degree Celsius. Grease a pizza pan or line with aluminium foil. 2. Roll the pizza dough using a rolling pin to a circle with 1 inch thickness. Fold the ends inside and press to get a small depth. Prick with a fork gently to make sure the base is cooked evenly. 3. Now spread the sauce and sprinkle the dried oregano. Then arrange the toppings over the base and add the grated cheese over the toppings. 4. Bake the pizza for 12-15 minutes or until the cheese melts and the base turns golden brown. Cut into slices with a pizza cutter or very sharp knife. Serve immediately. 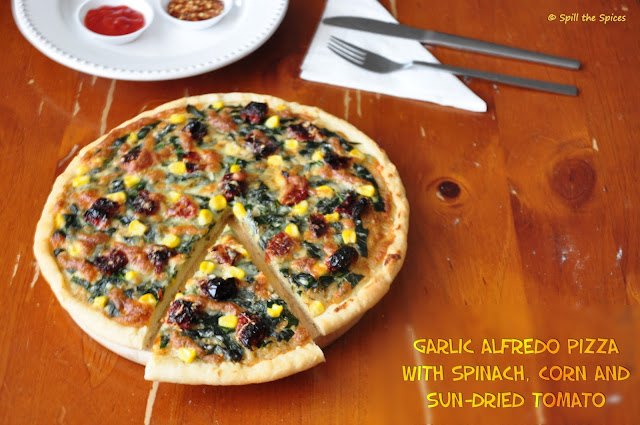 Enjoy with a sprinkle of chilli flakes and tomato ketchup! wow.. looks really tempting.. btw what is baby spinach.. havent heard of that? Baby spinach and spinach differ in size and age. Baby spinach leaves are small, tender and sweet compared to regular spinach and are plucked at an early stage of plant growth while spinach are plucked much later after planting. You can use regular spinach if baby spinach is not available. i wish to have it right now:)can we substitute sun dried tomatoes with fresh ones? You can use regular tomato, but I guess it won't taste the same. Also tomatoes will add moisture content but sun-dried tomatoes won't as they are dried. You can try by adding de-seeded tomatoes to avoid excess moisture content. yummy yum pizza :) beautiful presentation..
That looks perfect Sona :)Love the topping combo. Yummy Pizza.. Love using alfredo sauce and nice toppings..
you had me at garlic alfredo sauce, its my favorite and putting on pizza, wow, looks so delicioius. you are tempting me gal..delicious..
Pizza looks very delicious. Loved the sauce and the toppings. The pizza looks very tempting. Loved the garlic alfredo sauce. Yummy...I hav store bought Alfredo sauce unused...shall try with that soon..